Back in spring, the city of Vacaville announced a city-wide public art project called We Know Jack. Twenty-five large fiberglass jackrabbits were given to local professional artists to decorate, then the Jacks were displayed at locations throughout the city. One lucky child would win an iPad for finding all the Jacks and collecting the code phrase from each. Rabbits + art + a citywide treasure hunt with a fabulous prize?! It's like this project was created with the deRosiers in mind! For our first venture out to find Jacks, we focused on the downtown area. There were six Jacks within walking distance. From the start, we were blown away by the creativity. During our second outing, we found five more Jacks. We found two more Jacks on the way to a Cub Scout den meeting. The next three Jacks were all in different buildings at the Vacaville Cultural Center. We found one Jack when we stopped for dinner after ice skating. This Jack was at the hospital. Here's another Jack in a restaurant. I requested that we spent Mother's Day hunting for the final six Jacks. It was a great way to celebrate. We ended our hunt at the Vacaville Museum, where they had a wonderful exhibit of artwork from each of the featured artists. We loved trying to guess which artist had made each Jack based on their particular style. Another highlight of the exhibit was a 26th Jack, coated with chalkboard paint. Kids were encouraged to decorate their own version of a Jack. 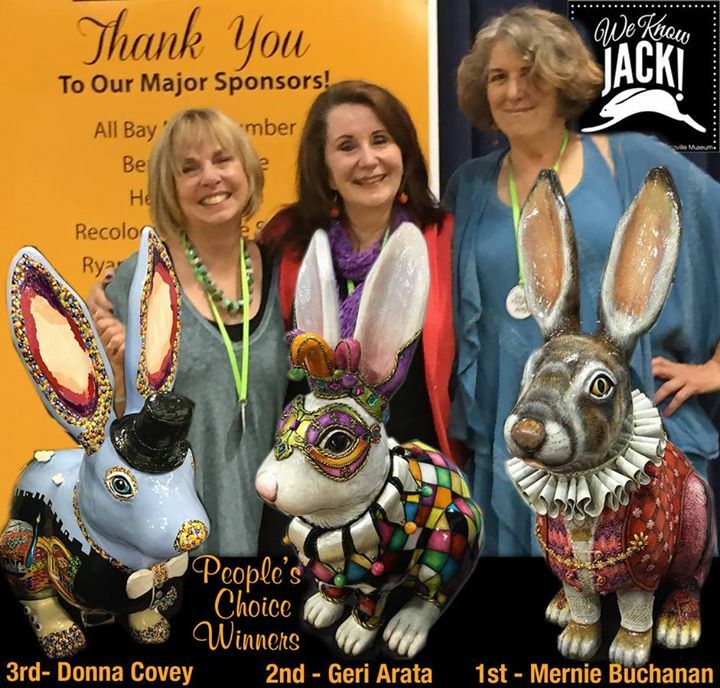 After being on display for several months, the Jacks were auctioned off to benefit the Vacaville Museum. Trevor REALLY wanted to buy one, but I told him that I was pretty sure they were out of our price range. I wasn't wrong. 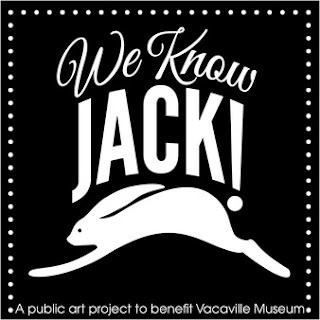 The 25 Jacks raised more than $90,000 (an average of approximately $3,800 per Jack) for the Vacaville Museum. Unfortunately, we do not have thousands of extra dollars to buy rabbit-themed artwork to display in our house where, in all likelihood, it would be subjected to damage by an actual rabbit. At the auction, they announced the winners of the public vote for Best Jacks. 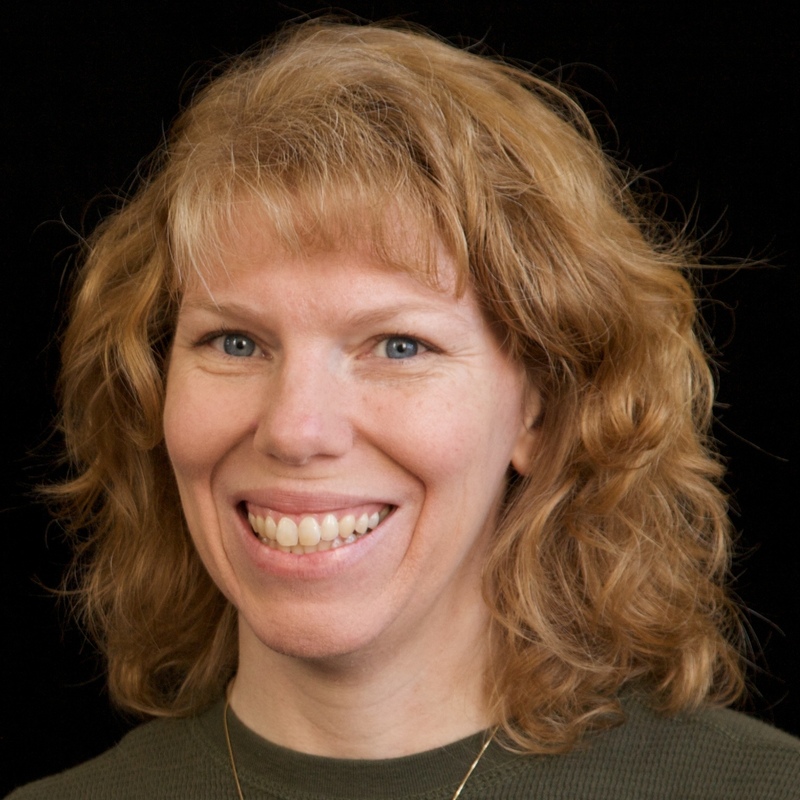 I was rooting for the Jack with a top hat and beautiful scenes of local sites by Donna Covey. Steve's favorite was the Shakespeare-themed Jack by Mernie Bachanan. Trevor's favorite was the stunning Jack featuring the California poppy, painted by Roberta Ahrens. Some of our other favorites included the Velveteen Jack, the red flower Jack, the Jack covered in Jelly Bellies, the Mardi Gras Jack and the Hareshey's chocolate bunny Jack. My favorite, the top hat Jack came in third. The beautiful Mardi Gras Jack by Geraldine Arata took second (and brought in the most money, at $6900) and Steve's pick, the Shakespeare Jack, took 1st. You can see high-quality photos of all 25 Jacks here. We had so much fun finding the Jacks and enjoying the talents of our local artists. We loved seeing the various materials used and the creative names the artists gave their Jack. What a wonderful project this was! Huge thanks to all involved and congratulations to each of the artists. Very cool! Another fun adventure! As I was scrolling through your photos I would pick a "favorite" Jack but then quickly change my mind; they are all so beautifully painted! 2 of my faves were in the top 3 (2nd and 1st place). I'm assuming Trevor didn't win the iPad..??? Correct - he didn't win the iPad. But we had such a fun time finding them all! We changed our minds about our favorites dozens of times. If we did have $3000+ to spend on a Jack, I don't know that we could have agreed on which one to get! How fun! I love the Shakespeare one the best!!!!!!! !